I was working at my computer the other day, which happens to be in our Florida room, when I noticed that Frankie was excited and interested in something just outside the window. 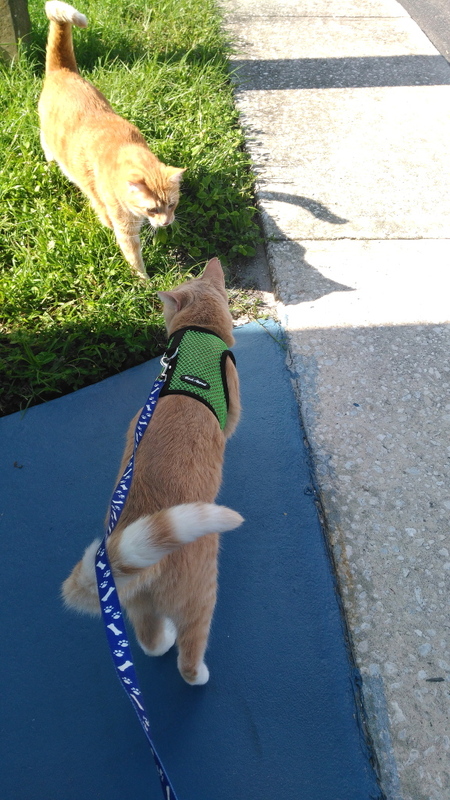 I got up to see what he was looking at and there was the face of a gold cat just inches from Frankie’s face. 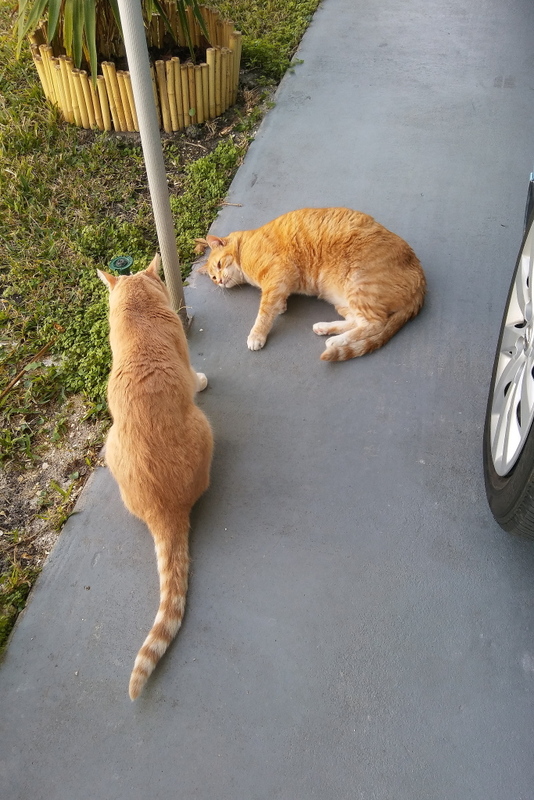 My first thought was, “Wow, we have another stray in the neighborhood” but it was only a second later that I noticed that the “stray” was Chris. I opened the door to let him in, of course, but was left wondering how he got out. I checked the catio door and it was shut and no screens were ripped. I then noticed that the back door out of the catio was open a crack. That door is only used when I take the trash out and it has a sliding latch that is difficult to engage sometimes. I guess I just didn’t lock it good enough. I don’t know how long he was outside but I glad he came back. I also think it is funny how he got Frankie’s attention to get back in the house. 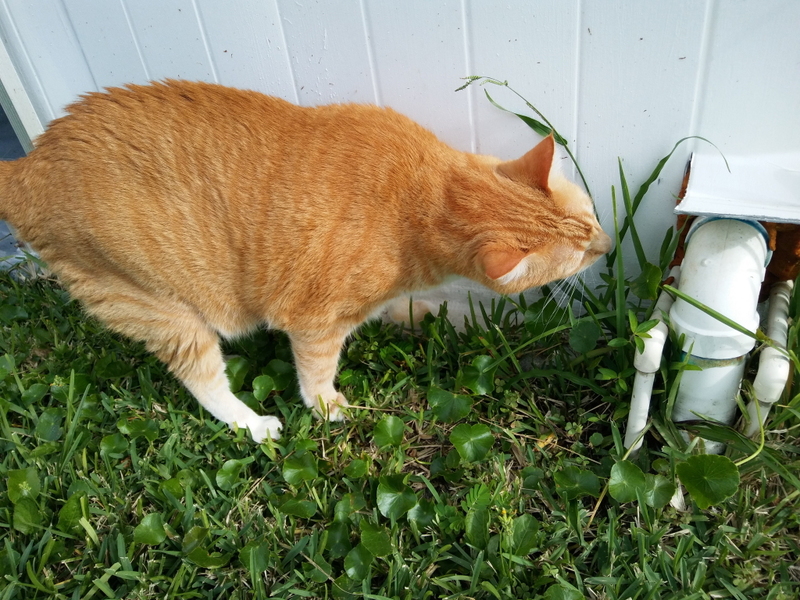 This entry was posted in Uncategorized and tagged cat, catio, escape on August 16, 2018 by Charles Huss. 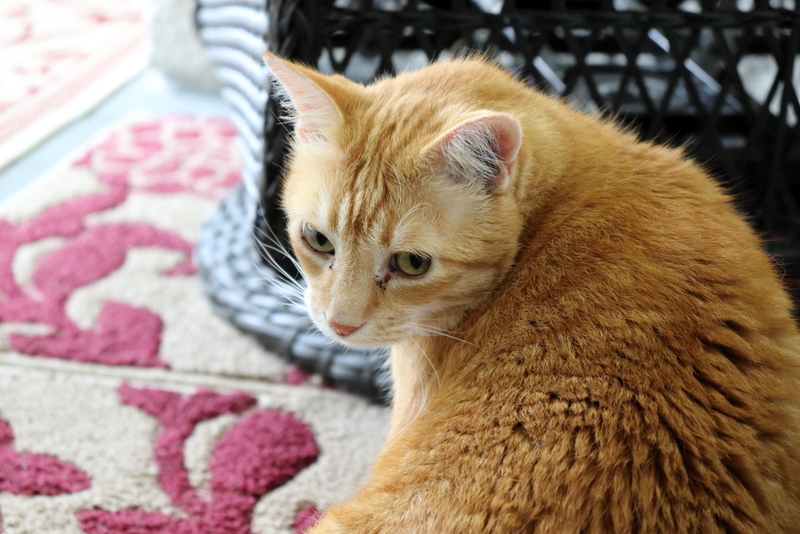 Last week I took out the trash which can be a pain sometimes if a cat is outside on the catio. 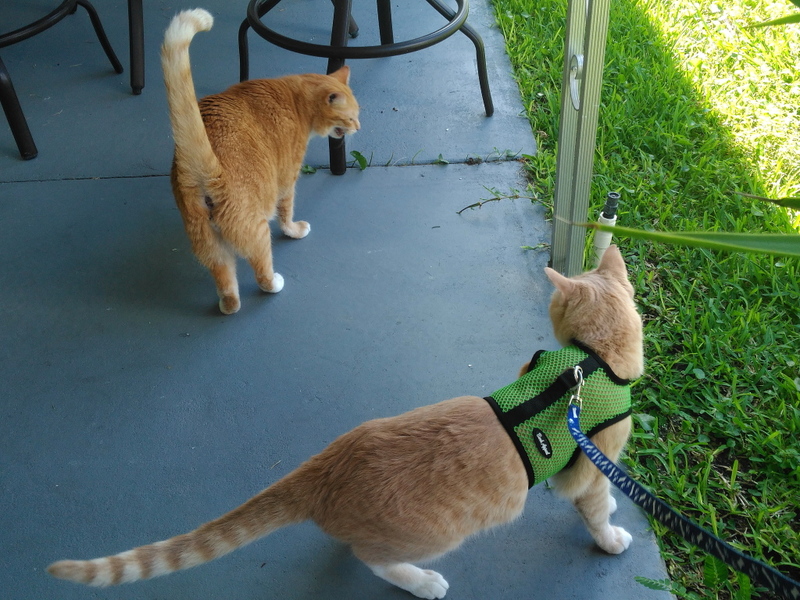 Our garbage cans are outside the back door of the catio and opening that door will cause Chris and Frankie to immediately run toward the door to try to get outside. Sometimes I quickly throw the trash on top of the can and close the door with the intention of putting it in the can later when it is safe. On this day I saw no cats so I thought I had time to open the door and put the trash inside the can. While I was doing that, Chris and Frankie bolted out the door at the same time. 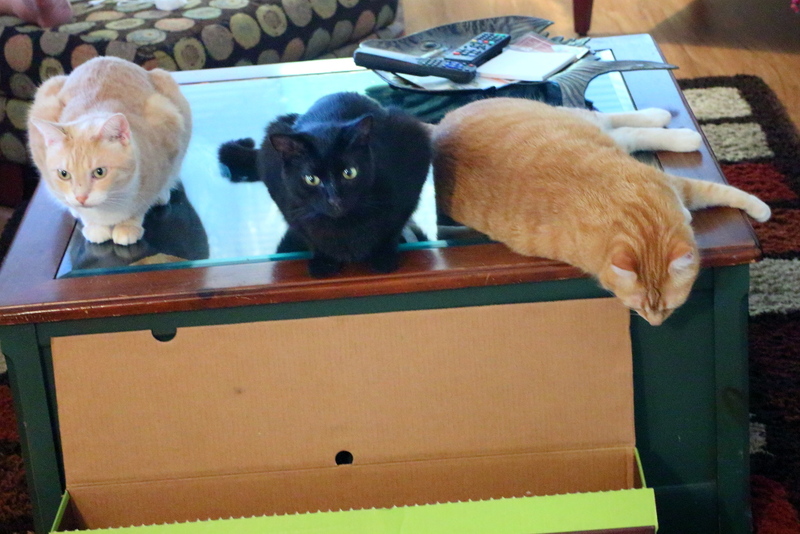 I either didn’t see them on the catio or I didn’t fully shut the door to the house. 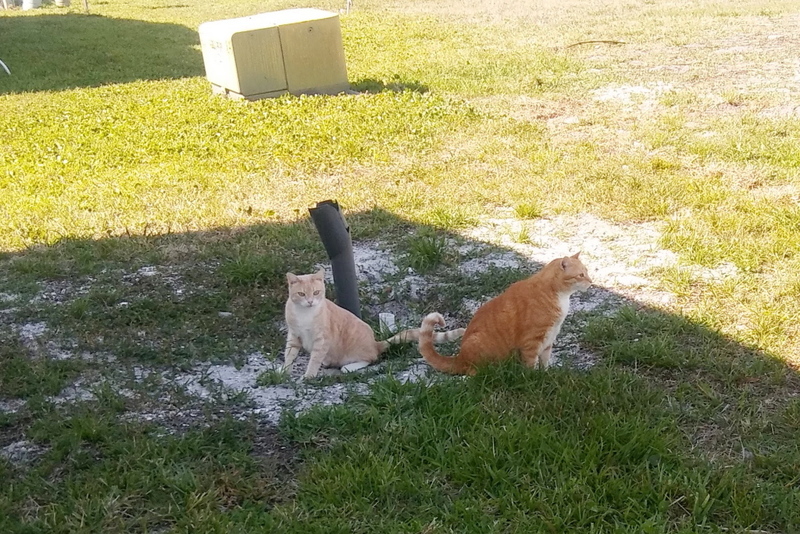 I ran back inside to put my shoes on and when I returned both cats were still hanging out in the backyard. Of course, as soon as I tried to pick up Frankie, he was gone. 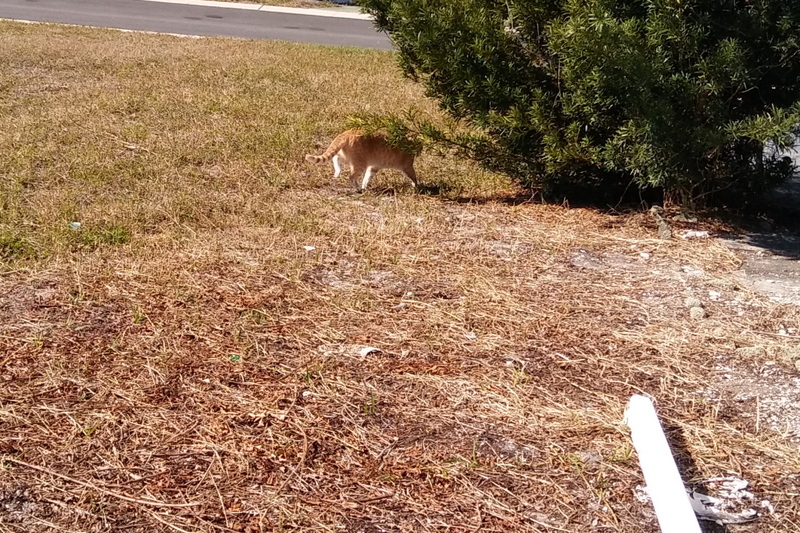 I pursued him and almost caught him when he was distracted by a lizard but he was too quick for me. I brought Chris inside when I lost track of Frankie and stayed home thinking he would return. After waiting a fairly long time, I went out looking for him. 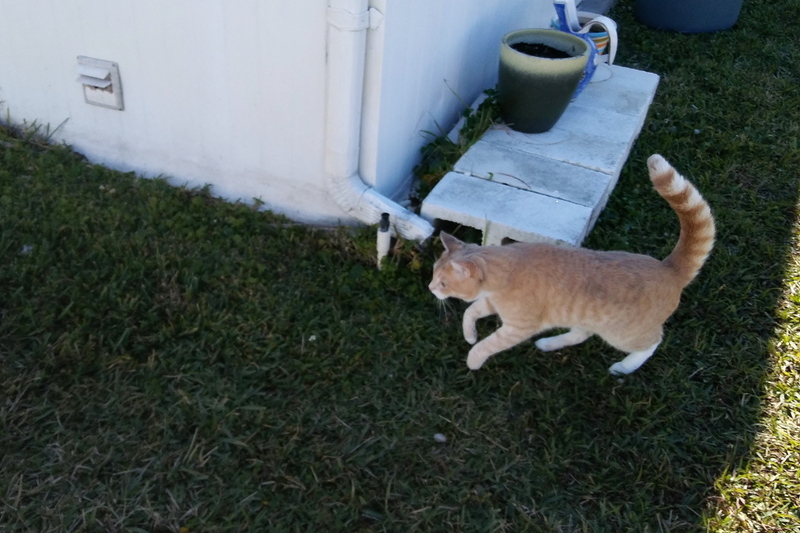 I walked around the area for ten or fifteen minutes and became concerned after not seeing him so I returned home to see if he had showed up there yet. When I got home Frankie was on the catio. I was puzzled. How did he get back inside? I was pretty sure he couldn’t open the door. That was Chris’s specialty. I decided that was a mystery that couldn’t be solved until my wife got a text message from our neighbor saying she found Frankie and put him inside. Mystery solved. I just want to know why he let her pick him up and not me. 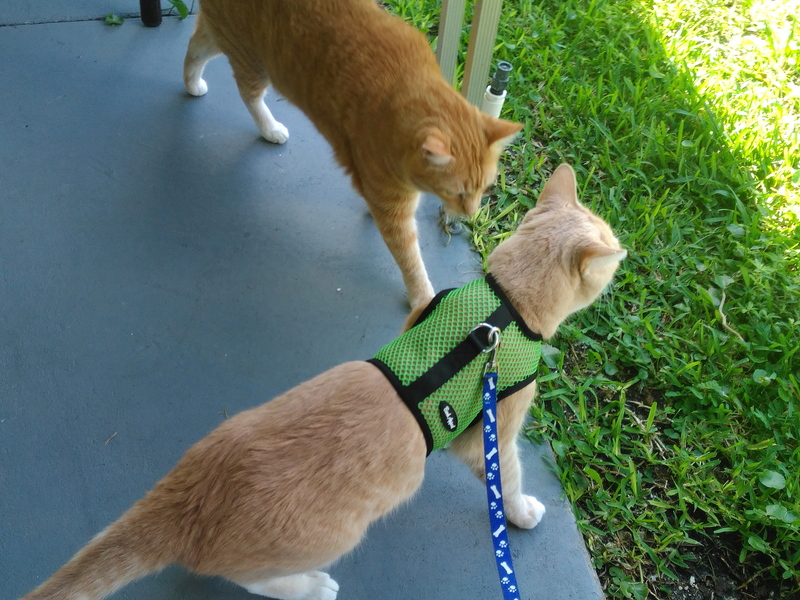 This entry was posted in Uncategorized and tagged catio, Cats, escape, mystery, Patio on May 6, 2018 by Charles Huss. Saturday afternoon I took Frankie for his weekend walk. 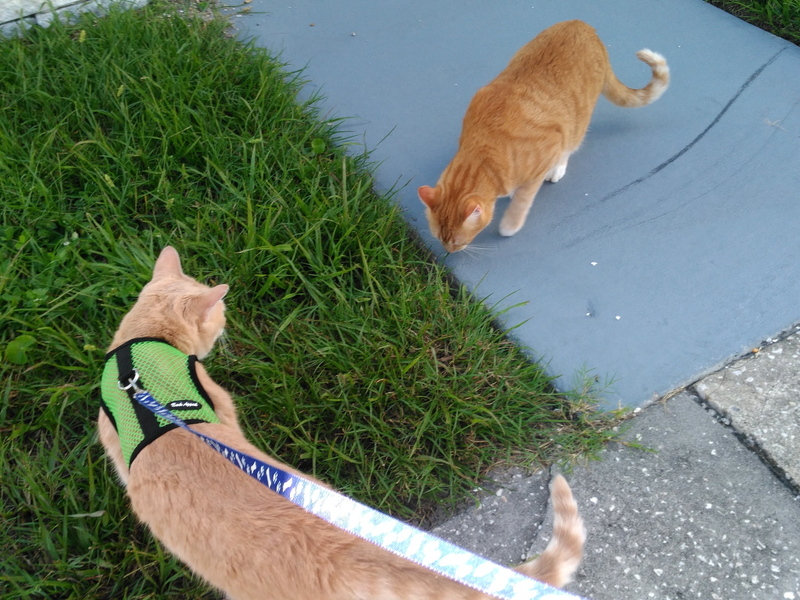 We walked across the street and up three houses. 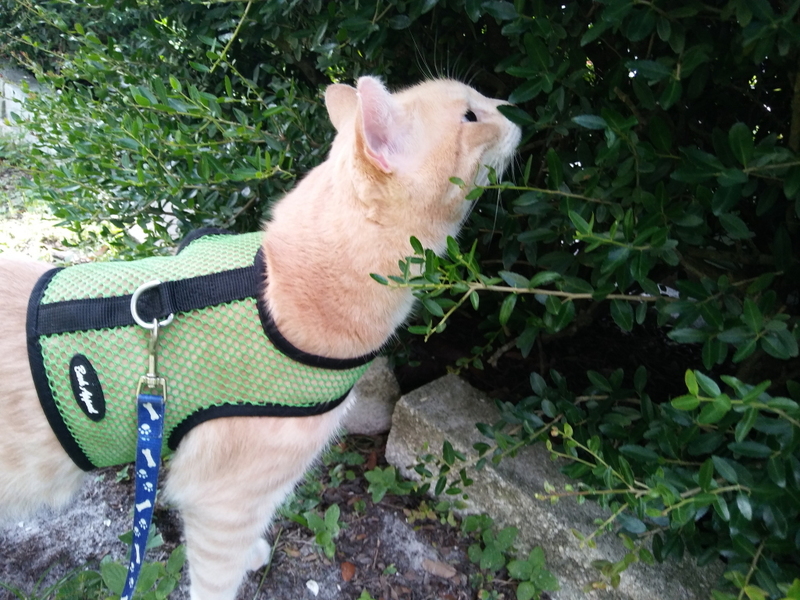 Frankie did his usual plant sniffing while I waited in the hot sun. Even though it was close to evening, it was still fairly hot. When he was done smelling everything he led me behind the house where the edge of the community meets the fence that separates us from the power lines. 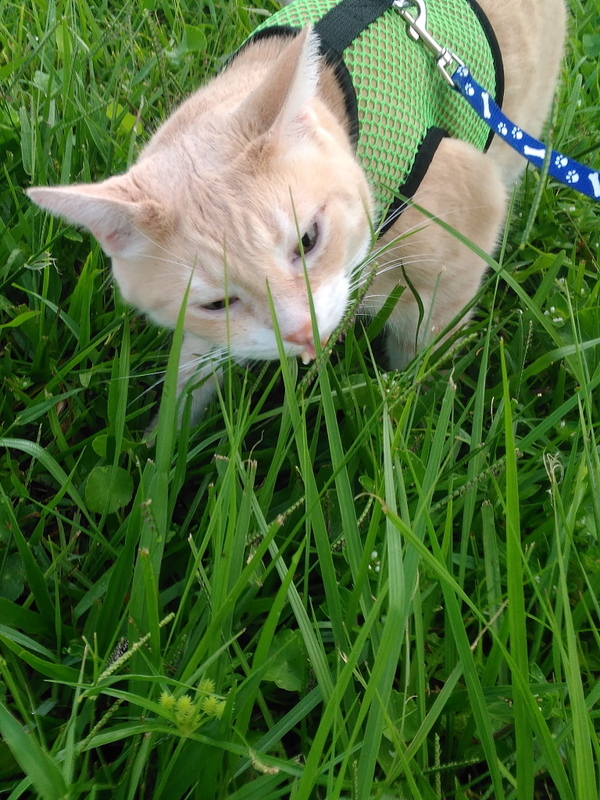 We stood under a tree while Frankie did more investigating with his nose. Suddenly I heard a crackling noise that was followed by a bright flash and almost instantaneously came the very loud bang of thunder. For about two seconds both Frankie and I were frozen in shock, especially since I didn’t even notice a dark cloud until after it happened. I didn’t see exactly where the lightning struck but it was very close and I became aware right away that we were standing under a tree. 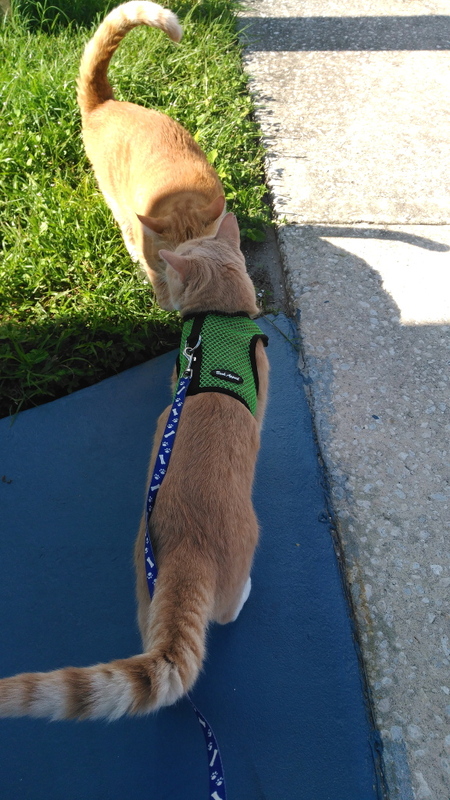 My first thought was to scoop Frankie up and get out of there but before I could move, Frankie ran and jerked the leash out of my hand. 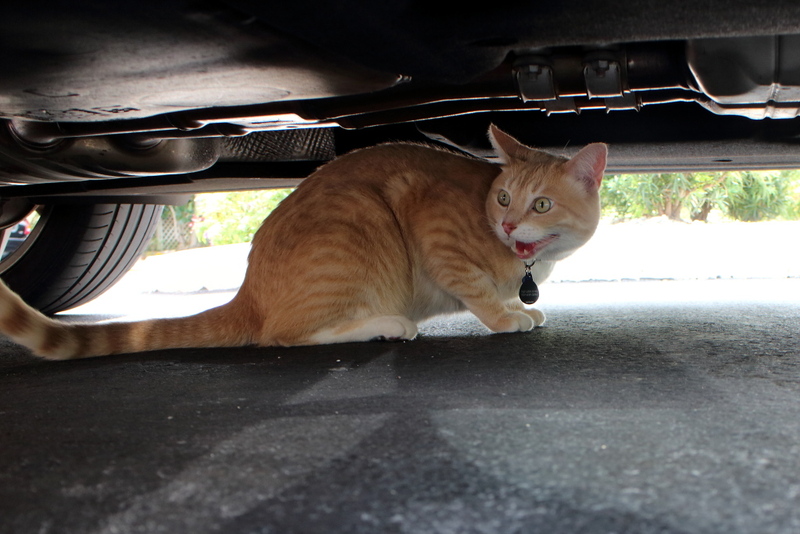 He ran straight home and hid under my car while panting heavily. I tried to talk him out but he wasn’t budging. Finally, I decided to take his picture and pulled out my phone. That is when he exited on the other side of the vehicle. 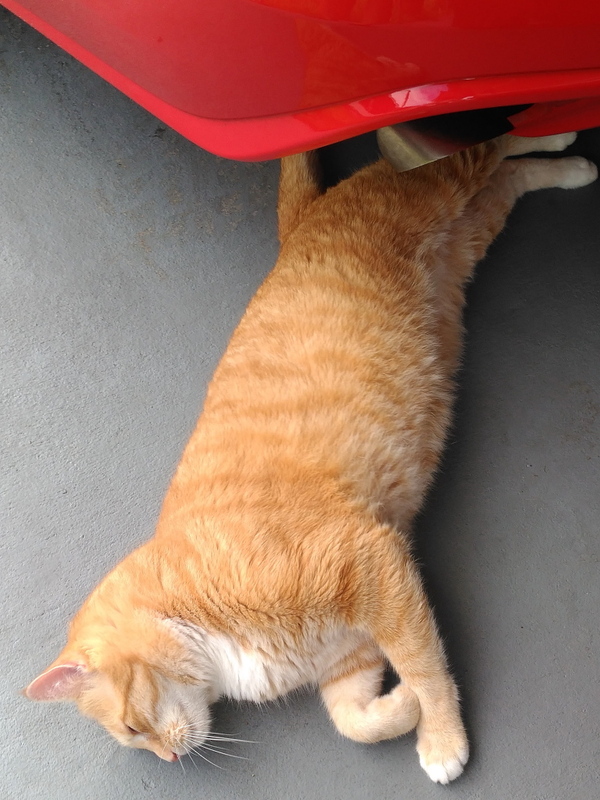 I didn’t get the picture but this is a picture from the past that shows what he looked like under my car. 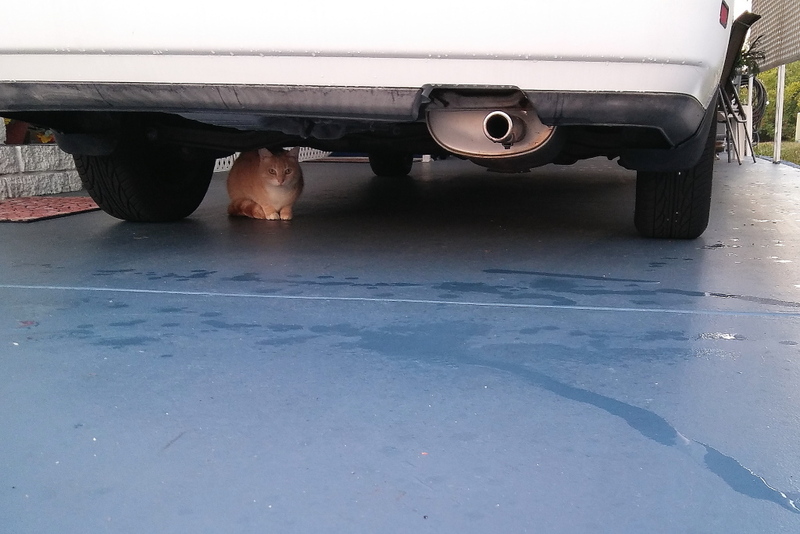 Once he got out from under my car he went for the back door and waited for me to open it. That was something he rarely does. Once inside, Chris was relentless with his begging to go out. He knows he goes out after Frankie and he would not let me forget it. After a short time, I decided it was safe and let Chris out. He was so happy to be out, no matter what the danger. This entry was posted in Uncategorized and tagged Cats, escape, hide, lightning on August 8, 2017 by Charles Huss. 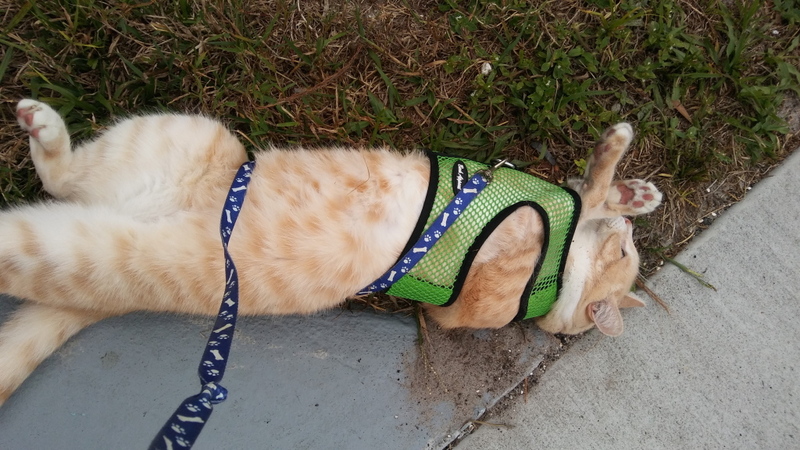 Last week I took Frankie for a walk and he dropped down and started rolling in the dirt. I assumed he was taking a dust bath and thought it was cute so I pulled out my phone and snapped a picture. 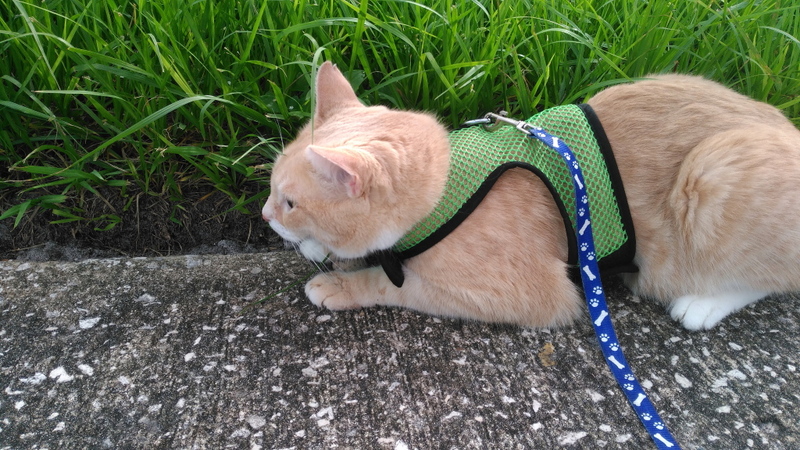 Shortly after he stood up I noticed his entire harness was around his waist and he was seconds away from escaping, so I grabbed him and fixed his harness before continuing our walk. It wasn’t until later, when I looked at the photo, that I realized he was doing his Frankie Houdini act for me. 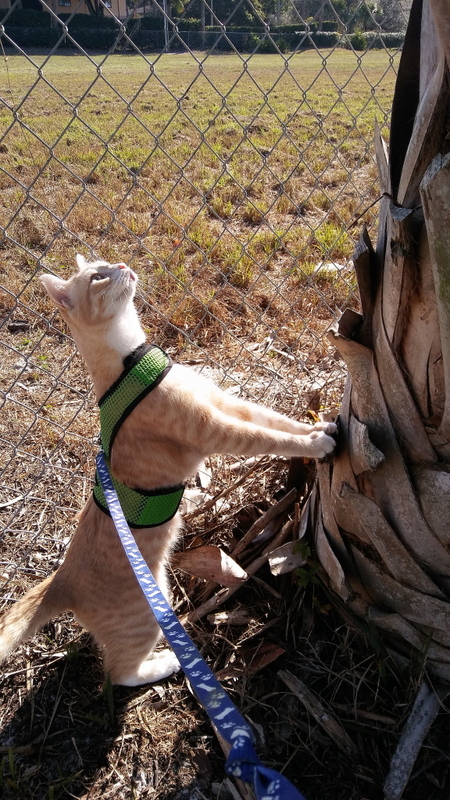 This entry was posted in Uncategorized and tagged cat, escape, funny, harness, ute on February 24, 2017 by Charles Huss. I have reached a point where I hate entering and leaving my house because Chris and Frankie are always at the door waiting to run out. 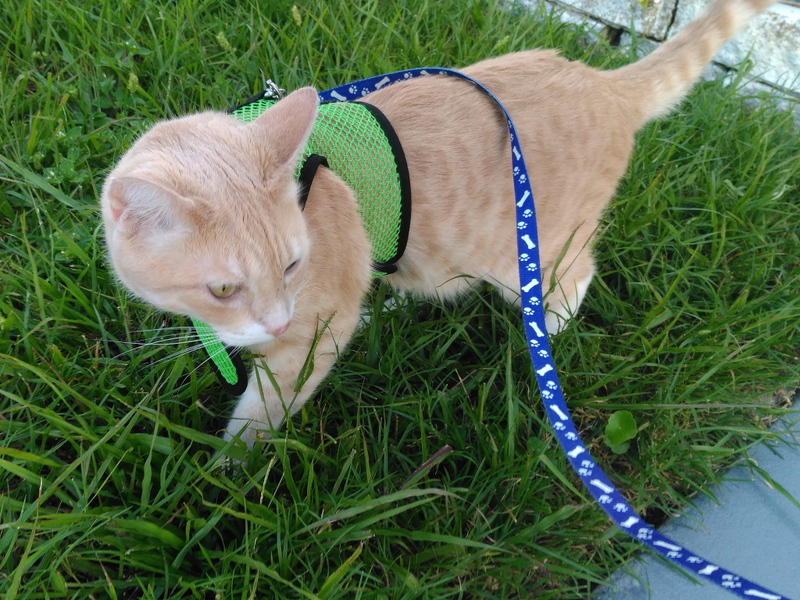 Frankie escaped over the weekend and led me on a wild cat chase. 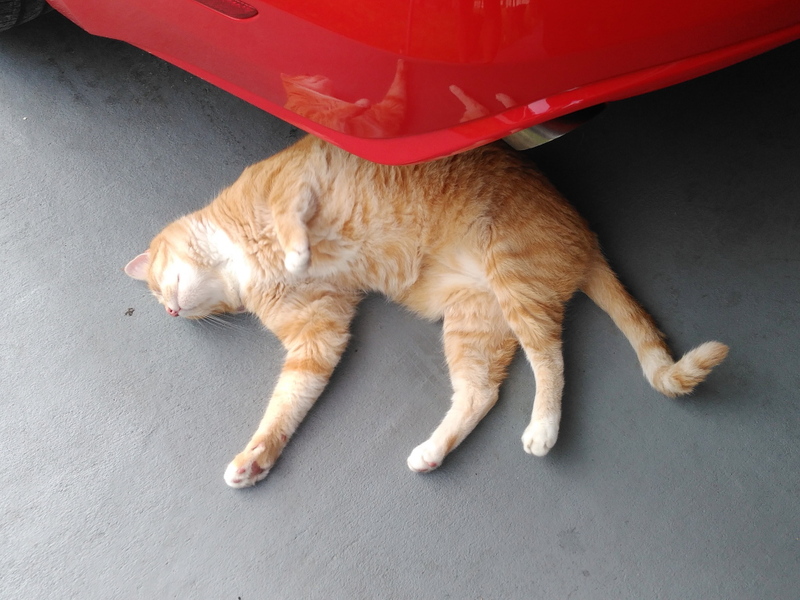 Eventually he ended up under the car next door where he knows I can’t catch him. 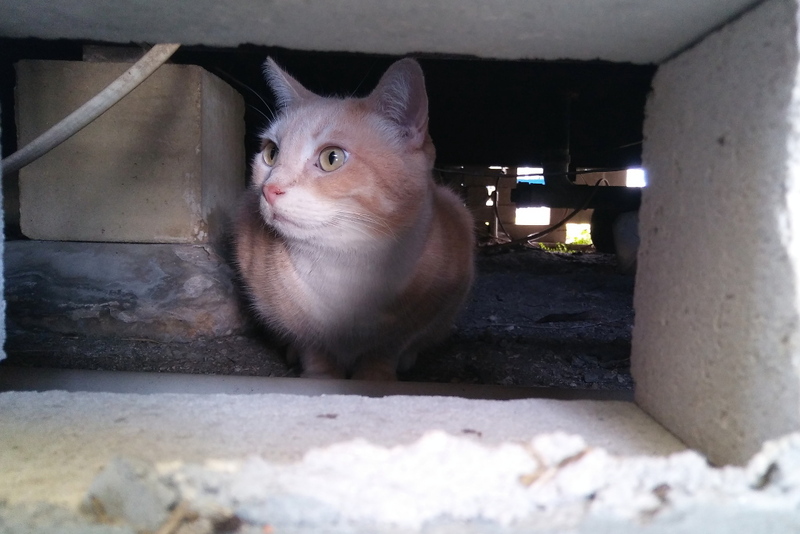 Whenever he goes under a car or a house I just have to wait him out, which I did. I sat on my front steps for about ten minutes and, surprisingly, he came out from under the car and started meowing at me. I called to him and he walked up to the edge of the steps. Since there was a railing between us I decided it would be safer to not try to grab him. Instead, I stood up, put my hand on the door and opened it when it looked like he was ready to come in. He hesitated for two second and then, as he was preparing to jump, Chris ran up to the door and scared him off. I think he ran out the door but I don’t remember. In any case, Frankie was in the wind again and it took some time before I was able to retrieve him. On Monday morning my wife had to leave early for a business trip. At 7 a.m. I helped bring her luggage out to the car. As I was going out, Chris appeared out of nowhere and ran out the door. I rarely swear but I must have sounded like a Boston Truck Driver that morning. It was a minor incident, since Chris is easy to catch, but the frustration of not being able to come and go out of my own house reached a boiling point. I put the luggage down and picked up Chris. I opened the door to put him inside and Frankie ran out. More swearing. Now my wife has to leave for her trip and I have to hunt down Frankie. I lost track of him so I finished helping Rose with her luggage. She then left and I spent the next ten or fifteen minutes looking for Frankie. I had never seen him disappear for so long and I started to worry about him. If Rose was home I would have asked for help. I walked around until my shoes were saturated from the cold, wet grass. It was then that I spotted him behind our house. Of course, he wasn’t ready to come in yet. 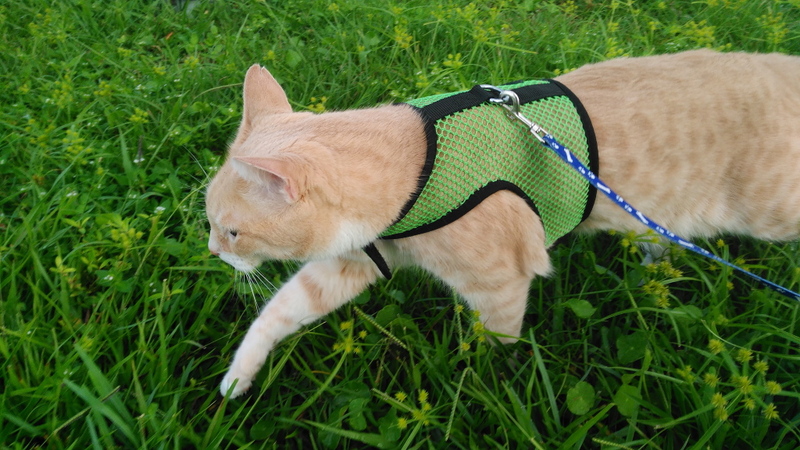 Now we played a game of cat and human until he tired and was ready to come home. He actually came up our driveway to the back door. I opened it and he walked right in. This time Chris was not there to spoil it. This entry was posted in Uncategorized and tagged Cats, escape on February 8, 2017 by Charles Huss.